They became world famous and Russia is proud of them. 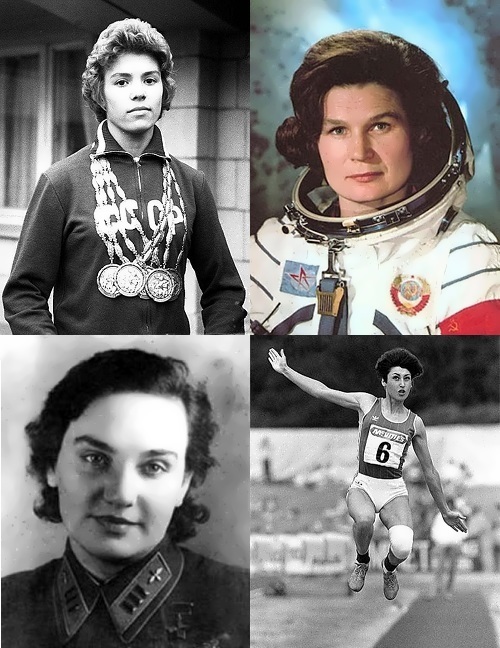 Valentina Grizodubova (April 27, 1909, Kharkov – April 28, 1993, Moscow) was a Soviet pilot, the participant of the Great Patriotic War, the first woman awarded Hero of the Soviet Union and Hero of Socialist Labor titles. For the first time Valentina rose up into the sky at the age of 2.5 on an airplane, which was made by her father, who was an inventor. In October 1937, Grizodubova set 5 world records on light airplanes. And in September 1938 together with aviators Polina Osipenko and Marina Raskova made a nonstop flight from Moscow to the Far East. It was the International Women’s distance record flight of 6540 km in 26 hours 29 minutes. During World War II the aviator only in May 1943 made 200 combat flights (132 of them at night). 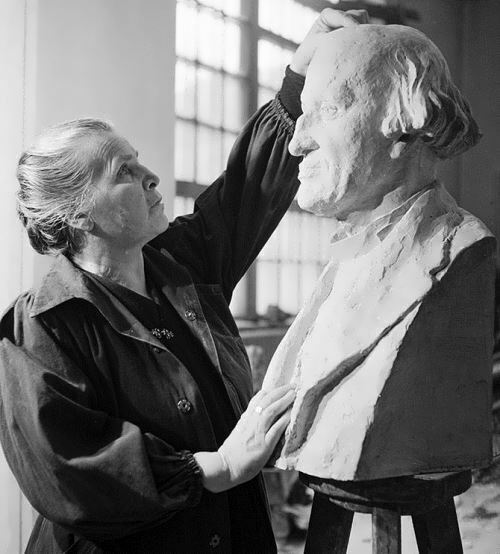 Vera Mukhina was a Soviet sculptor, People’s Artist of the USSR (1943), member of the Academy of Arts of the USSR (1947). By the way, she is the winner of five Stalin Prizes. 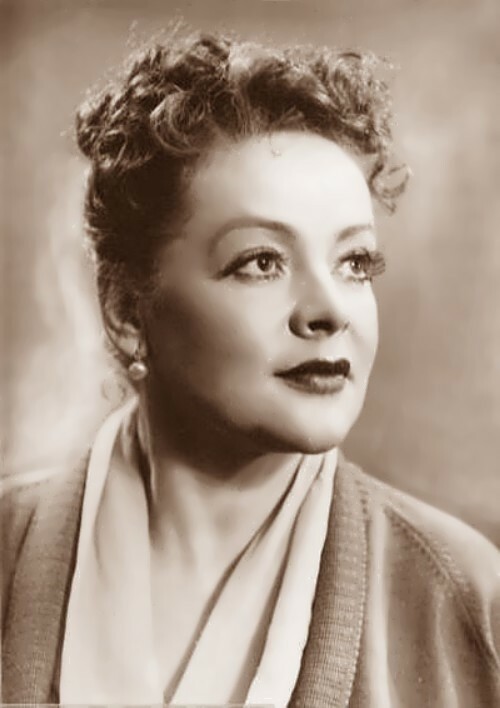 Vera was born on June 19, 1889 in Riga (now Latvia) into the wealthy merchant family. Her ancestors lived in Riga after the war of 1812. When the little girl was two years old her mother died from tuberculosis. And father took Vera and her elder sister Maria to Feodosia, where they lived from 1892 to 1903. In Feodosia the future artist began drawing and painting. When their father died in 1903, the girls moved to Kursk, where their rich uncles lived. Vera was a very talented girl, she played the piano, drew and wrote poetry. After school Mukhina moved to Moscow, where she studied painting. Zinaida Reich was a Russian actress, the woman, who won the hearts of two geniuses – Sergei Yesenin and Vsevolod Meyerhold. She was called the demon woman who destroyed the lives of two brilliant men. Pretty girl was born on June 21, 1894 in Rostov-on-Don. Her father was a Social Democrat. In 1907, due to his participation in the revolutionary events, family was expelled from Odessa. Later, in 1913, the girl became a member of the Socialist Revolutionary Party. It was difficult for her mother to get a certificate of secondary education for the daughter. After that Zinaida went to Petrograd, and her parents moved to Orel. In Petrograd Zinaida entered the Faculty of History and Literature, where she studied foreign languages and took lessons in sculpture. After graduation, the girl worked as a secretary-typist for the Delo Naroda newspaper, where she met her future husband, Sergei Yesenin. To tell the truth, she was the muse of the poet not so long – they got married in 1918 and 4 years later the marriage broke up. 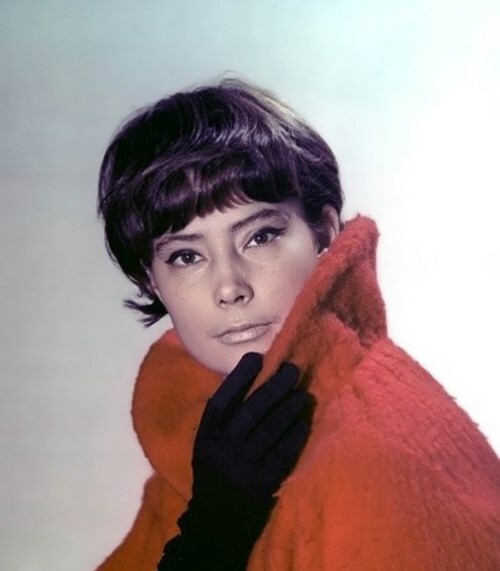 On May 4, 2014, the day of her 80th birthday, star of Soviet cinema Tatiana Samoilova died of heart disease. Pretty girl was born on May 4, 1934 in Leningrad (now St. Petersburg). She was the only daughter of remarkable Soviet film and theater actor Yevgeny Samoilov. But, in 1937, the family moved to Moscow. Tatiana graduated from the ballet studio and even was invited to study at the ballet school of the Bolshoi Theater by outstanding ballerina Maya Plisetskaya. However, Tatiana always wanted to be an actress. 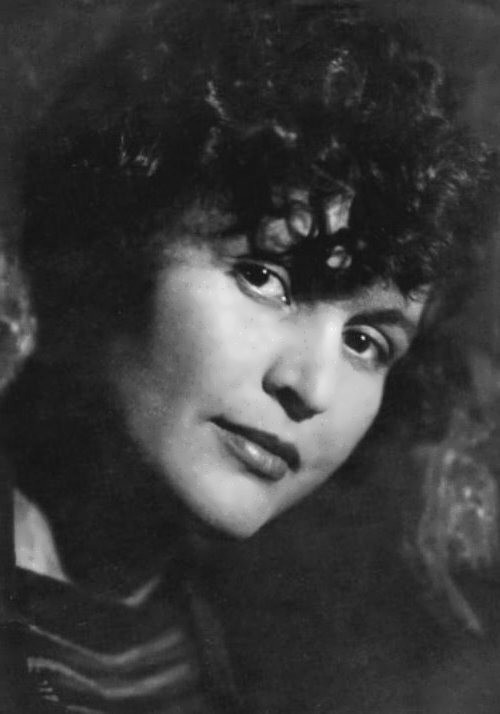 And in 1953, Samoilova entered the Shchukin Drama School, where she met her future husband Vasily Lanovoi. Tatiana played her debut role in 1955 in Vladimir Kaplunovsky’s movie The Mexican based on the story by Jack London. The success of the film was huge, but the girl had problems at school. The students of drama schools were strictly forbidden to act in films. In 1956, Tatiana had to leave the school. And in the same year she received an invitation to play the title role in film The Cranes Are Flying based on Victor Rozov’s play Forever Alive. The role of Veronica was one of her most important roles. On November 20, 1925 one of the world’s most famous ballerinas Maya Plisetskaya was born. She is truly a legend, her dancing is magic, Nirvana and just breathtaking. She deserved those long standing ovations. In order to be a ballerina Plisetskaya, being evacuated to Sverdlovsk during the Great Patriotic War, without a permit went to Moscow to study ballet. In spring 1943 she began working at the Bolshoi Theater. In the first season Plisetskaya danced Masha in The Nutcracker, then Mirta in Giselle, she was the first Autumn fairy in Cinderella, Kitri in Don Quixote. In Sleeping Beauty Maya performed the role of Aurora. Soon Plisetskaya became a prima ballerina of the Bolshoi Theater, succeeding the great Galina Ulanova. Later Plisetskaya’s Dying Swan became famous throughout the world. By the way, before the dance, she visited the zoo and watched swans’ plastic, head movement and wingspan. Ballerina danced Swan Lake for more than 800 times. Her regular partners were Alexander Bogatyrev and Alexander Godunov. Grand Duchess Anastasia Nikolaevna Romanova was the youngest daughter of Russian Tsar Nicholas II. 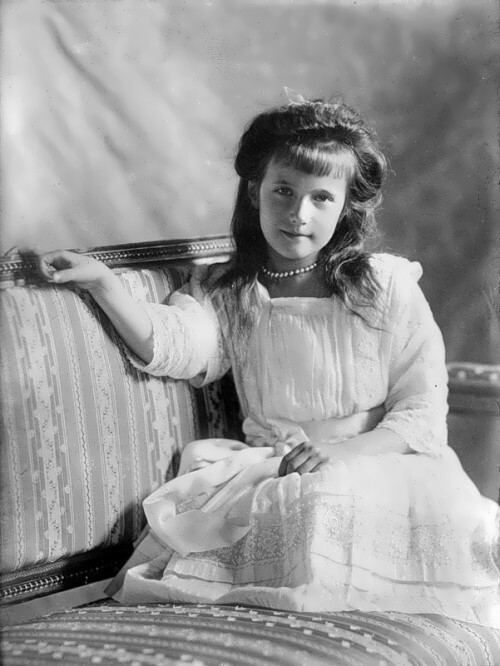 Anastasia was born on June 18, 1901 in Peterhof. When she was born, there were already three girls in the family, then a son and an heir Alexei was born. Anastasia and her elder sister Maria were known within the family as The Little Pair. They spent much time together. Little Anastasia was a cheerful and a sociable girl. Nastya, as every Tsar’s child, was a well-educated girl. She studied the French and the English languages, history, geography, the compulsory Bible chairs, natural sciences, painting and the required lessons of dance and etiquette. The girl was 17 years old when the royal family was shot down on July 17, 1918 in the Ipatiev House in Yekaterinburg.